I've always been a fan of a great silk blouse. This colorful, wide stripe beauty has to be my favorite so far. I wore this outfit this past weekend while we were in Charleston, SC. The bright colored, wide stripes were perfect for that city, known for its' fun rainbow colored homes. I love how the stripes gradually get darker towards the bottom of the blouse. It's a silky material with pleats under the front pockets and on the back to add a little feminine flair. We had a fun time in Charleston this weekend. We were there for my son's soccer tournament but it was also a fun family getaway. Carter's team ended up coming in 2nd place, they played great in all 4 of their games, just could't pull it out in the end. 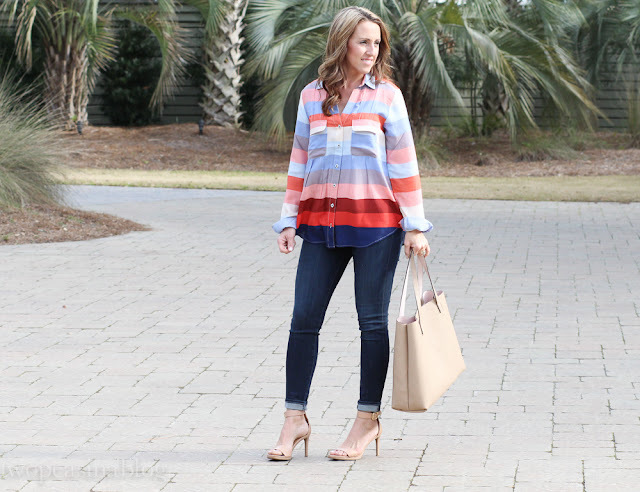 This week's feature blogger is Lauren from From Earth to Style. We love her all neutral look, especially that gorgeous herringbone scarf. It looks so soft and warm. 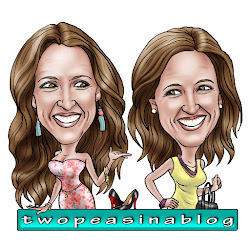 Be sure to check out her blog, she recently took an amazing trip over seas and the pictures are beautiful. 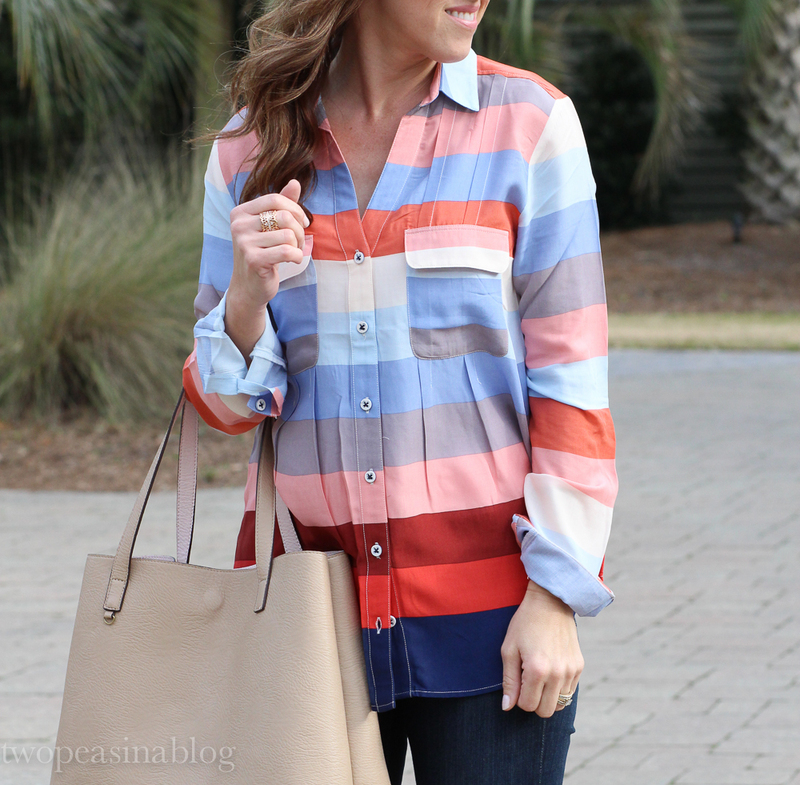 Love the colors in that blouse! We visited Charleston a few years ago for a music festival and it was so much fun--I would love to go back! Yes its a fun and beautiful area!! Luckily we only live a few hours away. Gorgeous blouse! Love the colors! Love the color block look! 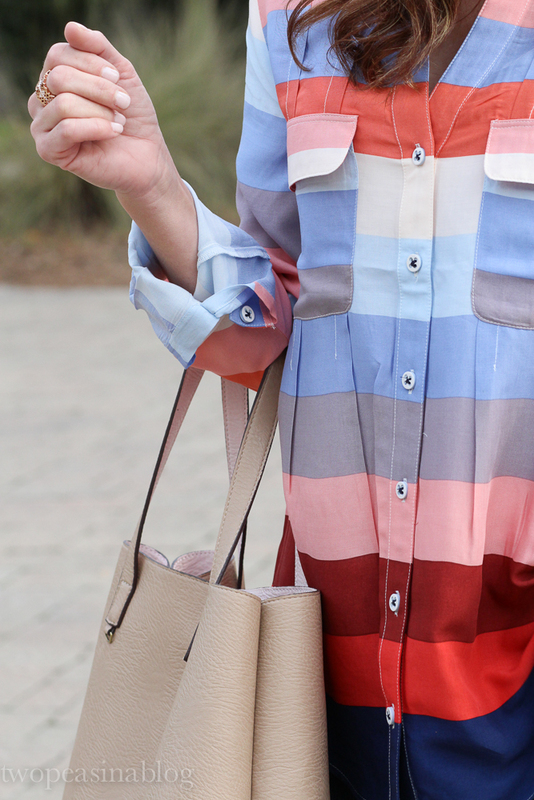 Loving the colors of your blouse! Glad you had a fun trip! What a lovely blouse and more phenom in those huge colored stripes - Hope you're having a FAB week! 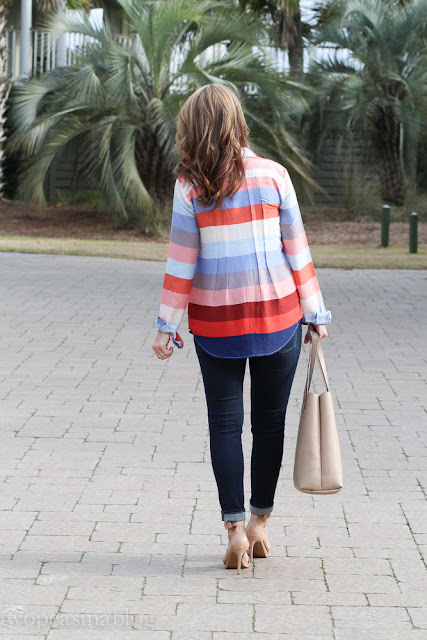 What a fun top for spring! Thank you for hosting and hope you are having a fab week! I am so ready for Spring clothes and bright colors!!! I love that plaid its so cute and fun, full of wonderful colours!!! Amanda, glad you stopped by!! The city has so much charm and history!! The tote is one of my most used. Have a great end to your week! 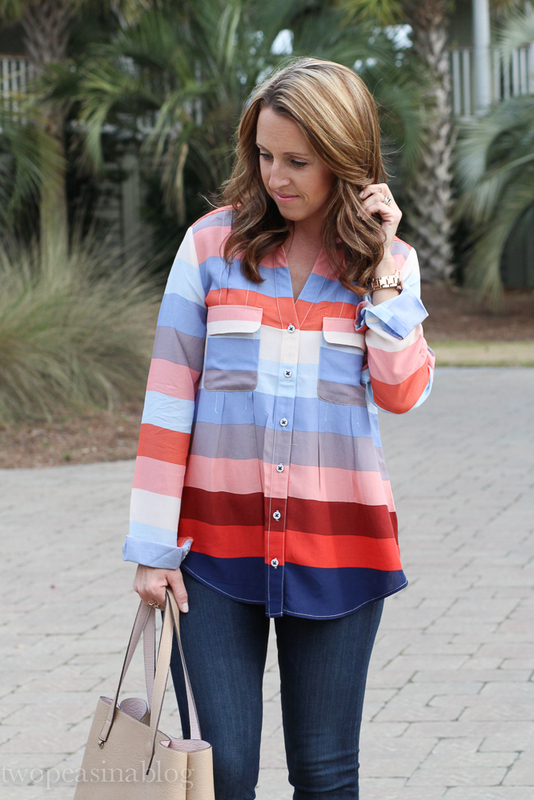 Love these colors in the blouse!! 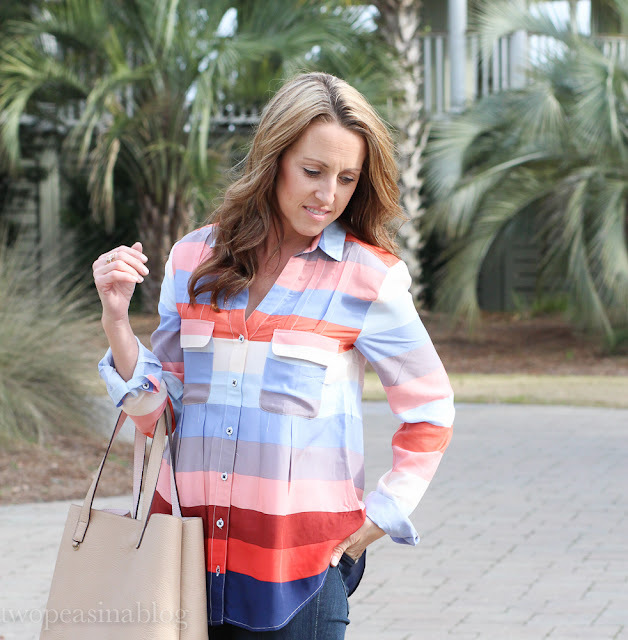 Love the color and pattern of your top! So pretty! 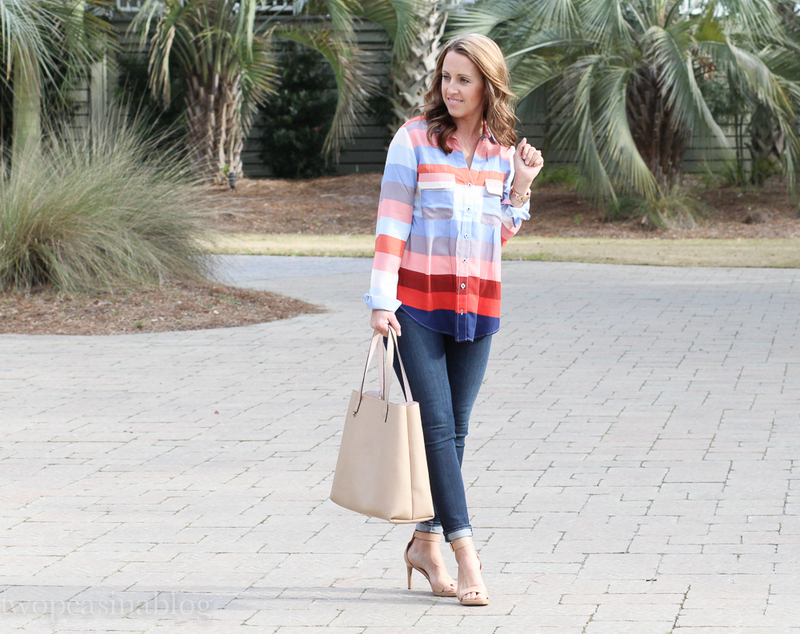 Beautiful color block shirt, goes so well with the neutral accessories. Oh this top is so pretty! I love the soft colours in it. Gorgeous shirt! I love the colours!